A simple client-side add-on for Tinkers’ Construct that adds relevant stats to all tool and tool part tooltips. 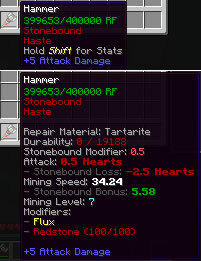 Supports ExtraTiC, only shows the relevant information for each part, and color-codes the statistics based on the min/max of each stat. Note: This mod will do nothing if Iguana Tweaks is installed, because Iguana Tweaks adds its own stats to the tooltips.